Built to the most exacting standards by Yamaha’s experienced engineers, the UR242 is rugged enough to withstand all the rigors of the road. UR242 offers connectivity with Apple’s iPad and iPhone. When paired with Steinberg’s iPad-based Cubasis music app or other iOS audio apps, the UR242 offers a portable and effortlessly intuitive production experience. For utmost flexibility, the UR242 is equipped with a MIDI I/O - connect your synth, a drum trigger module or whatever MIDI device you prefer! 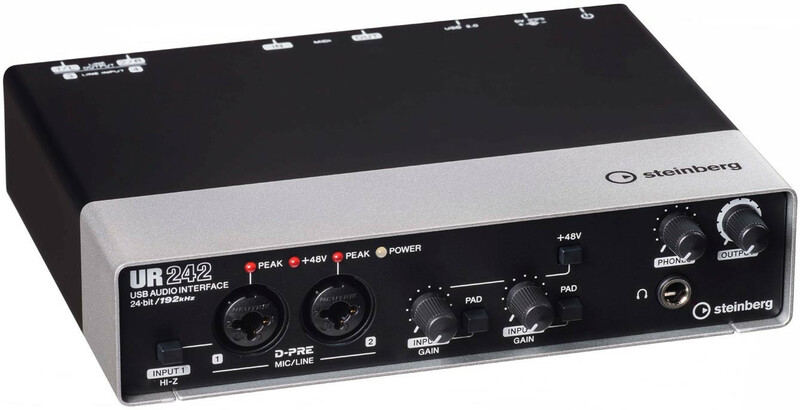 The UR242 offers musicians and producers far more than just a portable I/O device, or even an audio interface; the UR242 is a mobile production solution. That’s because it combines fantastic-sounding I/O and durability with advanced DSP-based FX that can be used with your DAW software, and that at a price point that is still easily affordable. The UR242 offers a perfect balance between three vital factors: quality, portability and cost. First-class components and integrated DSP-powered FX engineered to fit into a small yet rugged interface at an eminently affordable price point - that’s the UR242. Record vocals, guitars, MIDI gear and other audio equipment with up to 4 audio channels at once in pristine 24/192 quality, yet without making any compromises in terms of durability: full metal casing means the UR242 is ready for the rough and tumble of life of a mobile lifestyle. That could be between your recording studio and your hotel room, or between your home recording rig and your band’s rehearsal room: the UR242 offers the features and quality to manage a huge range of production situations. The UR series integrates seamlessly — as you’d expect — with Cubase, yet also with just about any DAW out there. Just like the 19" rack model in the UR range, the UR242 offers latency-free monitoring with DSP-powered FX thanks to the onboard SSP2 DSP chip and the latest dspMixFx technology. This gives you a fully integrated DSP-based monitoring setup wherever you are and with whichever DAW you use. When running with Cubase, the UR242 no additional virtual mixer apps are required! All aspects of I/O handling and DSP management are handled directly from within Cubase. Once your UR242 interface has been installed, Cubase detects the device and automatically embeds it into the Cubase production environment. Connect the UR242 to your iPad or even iPhone thanks to the Class Compliant mode. iOS music production apps like Steinberg’s iPad-based Cubasis are a perfect way to sketch out ideas at home or on the go; then hook up the same interface to your PC or Mac to take your musical ideas to the next level. With an impressive set of I/O capabilities for its size, advanced DSP-powered FX system, stellar audio components and compact dimensions, the UR242 is an exceptional interface that balances mobility with audio quality and advanced production features in a way unrivalled in its price range. With DAWs, virtual instruments and boutique effect plug-ins offering unprecedented audio quality on even modestly priced laptops that’s on par with the most expensive studio, many musicians and producers require a compact, portable audio interface that offers functionality and sound quality to match. The UR242 comprises components and technologies of an exceptional standard for its class, offering the audio aficionado a moderately priced, mobile solution on a level with the extraordinary audio quality of today’s computer-based music production software. Whether you’re laying down studio-quality guitar tracks or playing live through your laptop as a flexible digital guitar amp, the UR242 is optimized for guitarists. DSP powered virtual amp FX give you an amazingly lively, dynamic sound when monitoring - in zero latency. The Guitar Amp Classics FX suite offers four different analog amps to choose from, as well as full control over these startlingly realistic recreations of classic tube amps. The Hi-Z input on Channel 1 of the UR242’s two combo inputs lets you plug your electric guitar or bass straight into the interface, adapting the input to the high resistance of guitar signals. Add to this the great sound quality, rugged metal casing, full Cubase integration and easy install and set up, and it becomes clear why guitarists looking for a mobile solution for notebooks, Pads or even iPhones need look no further. Keyboardists and players of digital or stage pianos requiring a mobile interface will find the UR242’s mix of features compelling. Two Line inputs and a MIDI port provide “in parallel” recording of the audio signal and MIDI data, ready for further editing or mixing inside your DAW or routing straight through to the main outputs and out to the FOH mixer at live gigs. And with the incredible level of audio and build quality for an interface in this price class, the UR242 offers a fully featured yet affordable solution for any discerning keyboard player or stage pianist - for live gigs, in the studio or at home. Recording a small group or duet on a portable system — in studio quality — is one of the many tasks that the UR242 excels at. Set up a microphone for a vocalist and a guitarist, each singing or playing in front of a dynamic or condenser microphone, with a stereo pair of inputs available for a keyboard or stage piano. All three sources can be recorded at the same time in pristine quality with up to 24 bits and 192 kHz. The D-PRE mic preamp offers an incredibly transparent sound that can capture every last nuance of even the most delicate vocal performance or the most subtle instrument. And if your interface takes a couple of knocks while you’re setting up at the venue, no need to panic: the UR242’s metal casing and solid build quality can handle it. Performers and bands often choose to enrich their live sound by running backing tracks from Cubase or other DAWs running on a notebook or by using an iPad or iPhone. Next to the audio tracks, MIDI data can be used to cue up lighting or other visual equipment that’s perfectly synchronized to the song. As a robust, high-quality mobile solution, the UR242 is the ideal interface for running pre-produced backing tracks out to the FOH mixer. Its ASIO, Core Audio and WDM drivers have been exhaustively tested to ensure flawless operation, even at low latencies or high bit and sample rates. The metal casing will withstand the inevitable knocks and scratches on stage, while the sturdy AC adapter means a rock-solid electricity supply for the audio hardware regardless of the power demands on the notebook’s internal USB. The UR242’s blend of reliability and stellar sound quality make it the perfect choice for bands and performers. 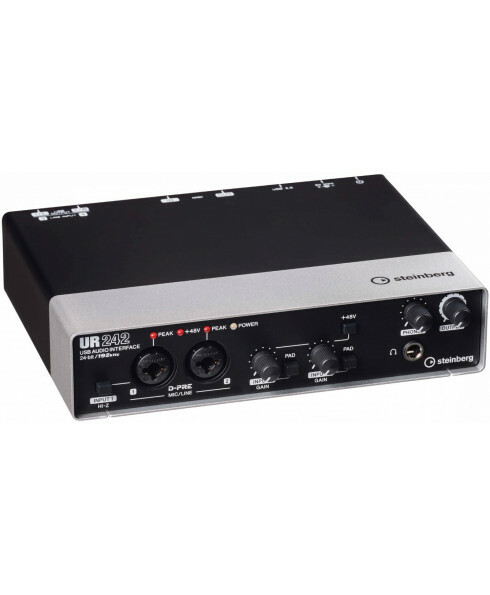 The two XLR/TRS combo inputs can be put to use in any of a number of recording situations. These could include recording two vocalists singing a duet; a singer who plays acoustic guitar with voice and guitar each recorded using a high-quality condenser mic; a choir or other classical performance recorded using two well-placed microphones; or any of the above accompanied by a backing track recorded using the two additional line inputs. MIDI instruments can be recorded ”in parallel” with both MIDI data and audio streams routed to corresponding channels in your DAW, letting you edit or rework the MIDI data in your project later. 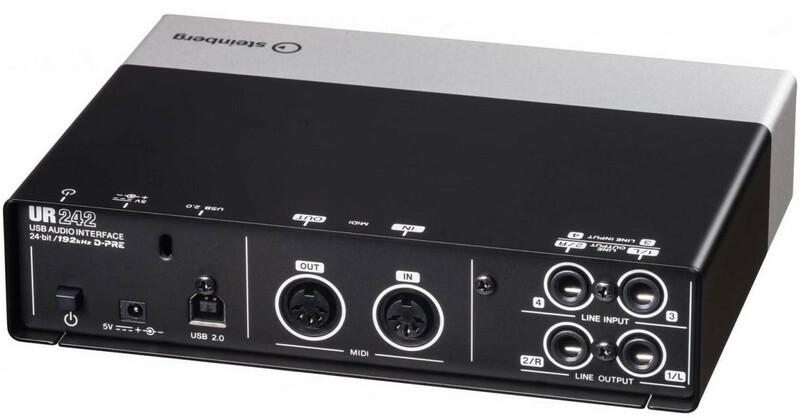 Monitor speakers are connected to the two output jacks on the rear, enabling the UR242 to offer a compact, high-quality MIDI-based production solution. Connecting an iPad or iPhone is accomplished using an Apple camera adapter*. Now you’re ready to record, edit and mix music on your iPad or iPhone, for example, using Steinberg’s widely praised Cubasis iPad app. Hook up a keyboard, drum pad or controller on the MIDI ports, with monitor speakers plugged into the dedicated Line output pair, and you’re good to go. The minimum system requirements state the minimal specification your computer must have to be able to use the product. CC mode requires iOS 9 (or higher) on iOS device. For further information click here.